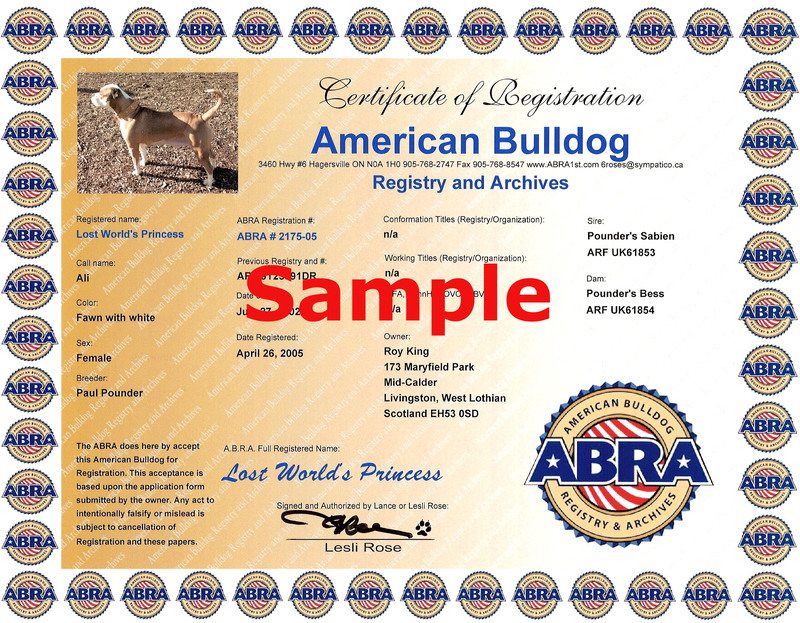 Even though there is a cost of this offer in time, paper, envelopes and stamps we believe it will be worth it in the long run as our goal is to dramatically increase the number of ABRA registered American Bulldogs. 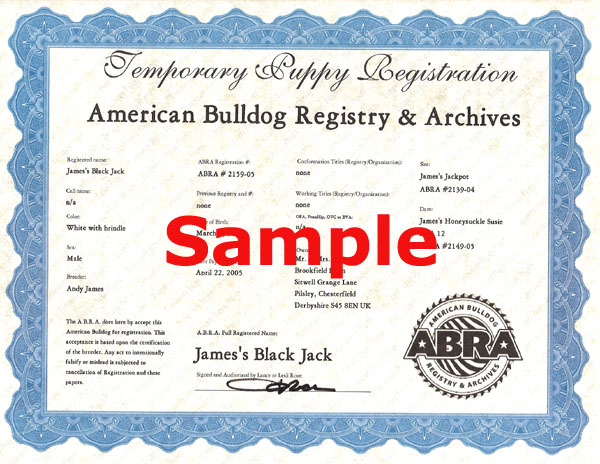 If the Dam and Sire are not ABRA registered please fill out single dog registration forms for them first. The cost to register the Dam and Sire is $30 each. Please also provide a copy of the parents registration certificates from another AB registry showing your name as the owner of the animals, a 3 generation pedigree and a photograph for each parent. The ABRA will send you Temporary Puppy Papers for the litter at no cost. Please make your application for these temporary puppy papers as soon as the puppies are born, due to the high volume of requests for the free papers the time to process is about 6 weeks. For BREEDERS that wish to give FULL SERVICE to their puppy buyers by supplying them with a permanent REGISTRATION CERTIFICATE and 5 GENERATION PEDIGREE the cost will be $30/puppy($15 savings for each puppy) and you will have to supply the FULL REGISTERED NAME (breeders kennel prefix must be at the beginning of each puppy's new full registered name), the new owners full name and address as well as a photograph of each puppy to be registered. And Microchip # for each pup if the breeder is microchipping the litter before sale. Check AVID for Microchipping details. Please use the same Litter Application Form and include the extra information pictures and payment, these applications will be completed as a priority because the puppies will have already been sold at the time of this application and we do not want to keep the owners waiting. If the Sire is also owned by the breeder a registration certificate will be mailed for the Sire as well.